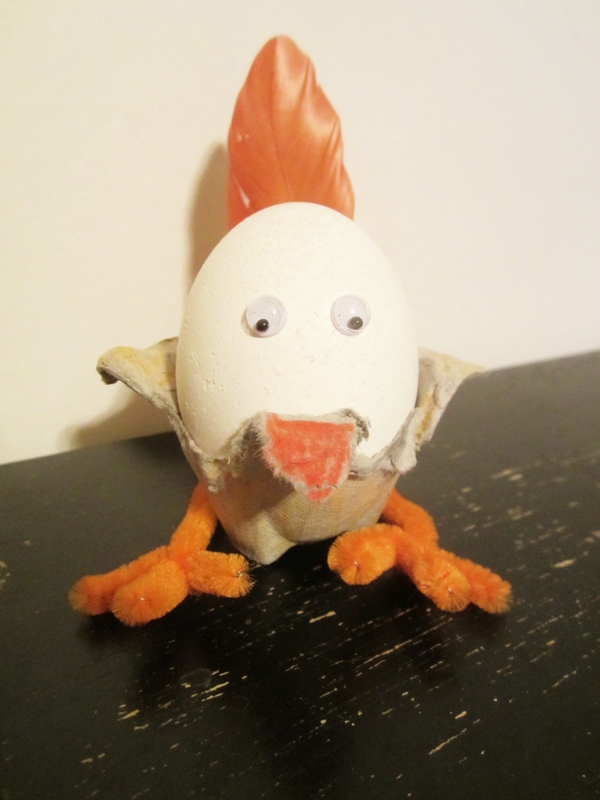 Egg Crafts: A great way to use your extra eggs! Easter is almost here and for many that means it’s time to get creative with eggs. Even if you don’t celebrate, these crafty projects are fun for everyone! Round up your flocks’ bounty and get crackin’. Supplies: Eggs, screw, straw, scrap paper, dye. To make: Line eggs in a carton. Poke a small hole in one end of each egg with the screw. You can twist the screw in to make the hole larger. Break away enough of the shell so you’ll be able to fill with confetti later on. Insert straw into the hole and stir. Tilt the egg downward, over a bowl and blow into the straw. The mixture of egg white and yolk will fall into the bowl…make some yummy scrambled eggs when you’re done with this project! Once the eggs are empty, wash them out. You can dye them any old way you would like at this point, or opt out of this step since your eggs are already so beautiful. Let the eggs dry completely. (You could whip up those scrambled eggs now). Cut up tons of scrap paper. This should keep the kiddos busy for a while. 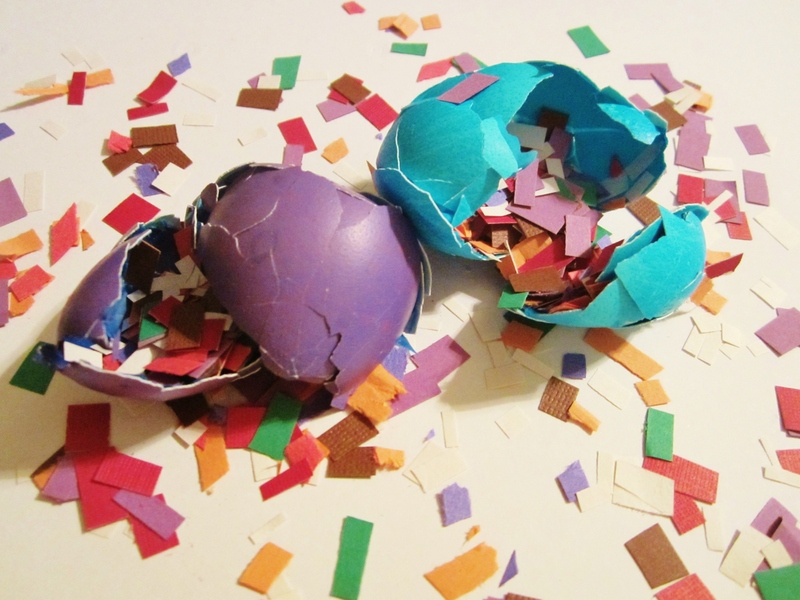 Once the confetti is cut and the eggs are dry, simply fill them with as much or as little confetti as you would like. Now comes the really fun part…smash them! You could trick your guests into thinking you’re cracking open a real egg on their head. A little prank on grandma never hurt anyone. Have fun and be creative! A less messy alternative: Fill your eggs with mealworms, cracked corn, or your flocks’ other favorite treat and smash the eggs outside. Your chickens become the clean-up crew! Have any other great filler ideas? Share them in the comments. We would love to hear from you! 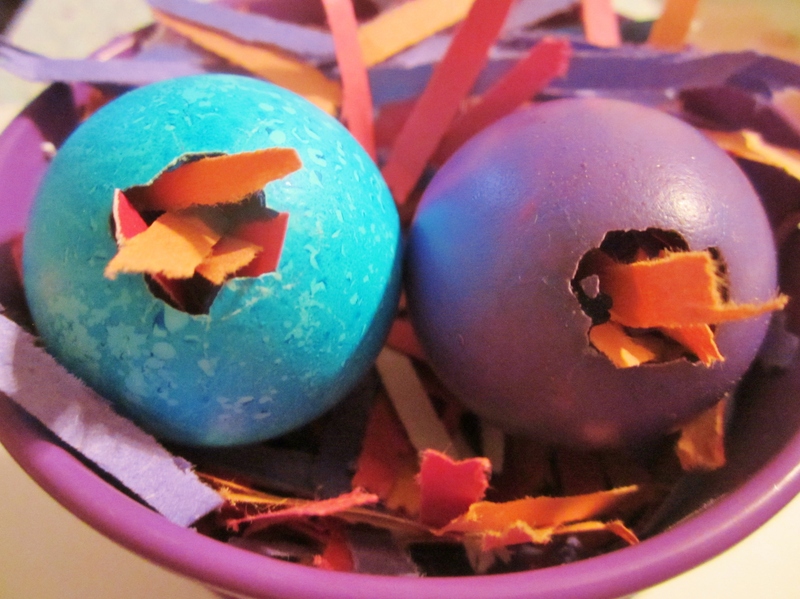 Supplies: Eggs, paper egg carton, crayons, feathers, pipe cleaners, your imagination! To make: Cut the gg carton into twelve “cups” these will become the body of your chick. Fold down one corner / flap of the body and color what will be the beak. The other two corners will become wings. Position egg in the body and create the face. We used wiggley eyes, but you can use anything you’d like! Use your imagination. You could make pipe cleaner glasses, give your chick a hat, bow tie, etc. Fashion the feet by molding the pipe cleaner into the right shape. Stick a feather behind the eggs and voila, you’re chick is complete! Sure would make an adorable dinner table decoration.